Fish&…that sounds interesting. Go on, then, what is it? It’s quite a clever little idea. 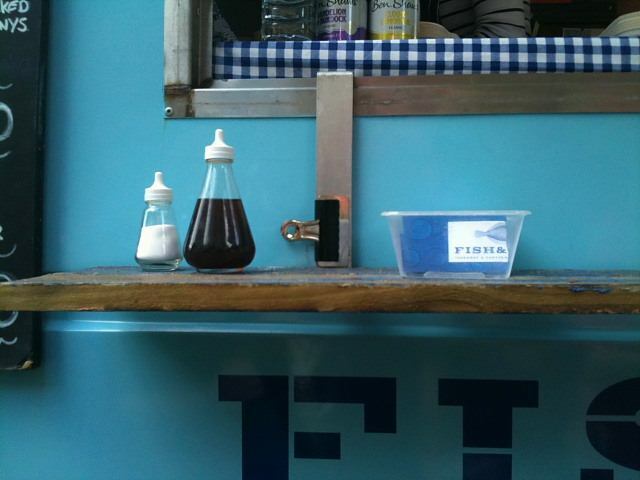 A nice, blue mobile fish and chip van that rocks up at festivals, parties, events and the like. We stumbled across it at the glorious Kirkstall Festival the other weekend…a sunny day, fantastic live bands in the Abbey’s cloisters, fairground, local groups with second-hand book stalls…that sort of thing. Fish and chips? Nice, but…ordinary? Fish & have a few little twists. They try a bit harder than your average mobile takeaway. They try harder than your average takeaway, actually…they just happen to be mobile. For a start, their fish is sourced responsibly from sustainable sources. It might seem a small point, but it’s an important one given the pressure our oceans and seas are under. Secondly, and even more importantly, their food is cooked with a bit of a flourish. 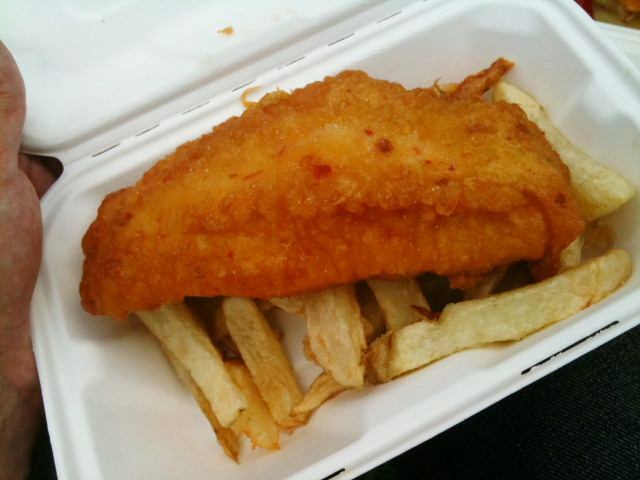 Of course, you can get a straight portion of normally battered fish and chips, but that would seem a poor choice up against some of the variations on offer. I had fish in a lemon, lime and chilli batter, flakes of chilli lodged in a crisp and very light batter. Enough chilli heat and spice to make a difference, not so much as to kill the taste of the fish. It was fantastic, unusual and interesting. Really quite different and very, very tasty. ‘Tapas’ style portions went down a storm with the kids, although the eldest did point out that he’d like a full portion next time, so good were the chips. There was calamari on offer, fried in that same lemon, lime and chilli batter, as well as mackerel baps, HFW’s invention and one of the tastiest and simplest things I think I’ve ever cooked. The mackerel bap is almost perfect festival food – easy to cook, easy to hold, easy to eat, good value and nutritious. To hammer home the point about careful sourcing, the bread rolls for the mackerel baps came from Anthony’s, which is almost showing-off, but they do do exceptionally good bread. To round out the menu, there was a fish finger sandwich. Fish& are about to launch a second hut at a pitch in central Leeds, and they do pop-up events here there and everywhere. Thoroughly good food, thoroughly well thought through, and a thoroughly good idea. Follow Fish& on twitter at @NoFishyBusiness and you can find them on facebook, too. Agreed! I developed a bit of Fish& addiction during Leeds Loves Food. Can’t wait for them to start selling their lovely food in Leeds city centre, will definitely add to street food options in town. STILL not eaten with these guys but see thier cute little hut all over the place. WIll definately seek them out. Nice pictures, btw!